The U.S.' declaration that the overnight missile strikes against Syria would be limited and a "one-time shot" may tamp down some of the risk to oil prices spiking when markets open Monday. At the moment, there appears to be no escalation of the conflict with Russian and Iranian forces, after the U.S. and allies the UK and France launched attacks hitting suspected chemical weapons facilities associated with Syrian President Bashar al-Assad. "We do know the operation is finished for now, and that it was indeed what most of us expected: a narrow action done for narrow purposes, punishing and deterring the use of chemical weapons," said Faysal Itani, a senior fellow at the Atlantic Council's Rafik Hariri Center for the Middle East. U.S. officials said they notified Russian counterparts through “normal deconfliction channels” that allied forces would be using Syrian airspace in the strikes, which did not hit any Russian assets. The pre-attack communication with Russia, a key Assad ally, signals an attempt to avoid direct confrontation, said Olivier Jakob, an analyst with oil consultancy Petromatrix. Oil prices had been pushed up to a three-and-a-half-year high of above $72/b on Friday, when US President Donald Trump signaled his intent to attack. 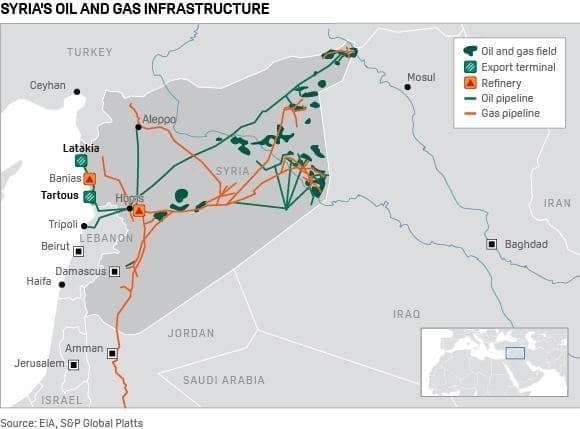 With Syria having little oil production of its own, the main concern over supplies arising from a confrontation would be the threat to key supply routes out of the Middle East. Related: How Significant Is WTI’s Breakout? "Any escalation in Syria may also instigate unrest elsewhere in the region, either against the US or its allies, raising the threat to the delivery of energy supplies," analysts at Barclays Capital warned in a research note published before the missile attacks. "So with the driving season fast approaching and OPEC making its June meeting decision to extend all but a foregone conclusion, it is difficult to see much downside to oil prices in the next two months of Q2," the note added. 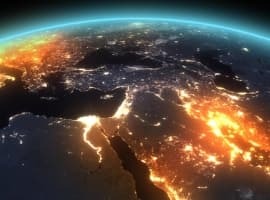 Chris Midgley, head of S&P Global Platts Analytics, said the market has not had such a large risk premium since 2012, when low stocks and the conflict in Libya, along with geopolitics in Iraq and Iran, pushed oil prices to more than $100/b. While the situation today is similar, the growth in US shale supplies has mitigated the likelihood of a price spike, he said. "The market does not yet need to pull more oil out of storage and, as such, is capped," Midgley said. "That said, the energy security situation is going through a worrying trend as nations look to secure access to energy supply while the US is backing out of key energy regions as it becomes increasingly energy self-sufficient." Russian President Vladimir Putin condemned the airstrikes as "an act of aggression" against Syria and said he would convene an emergency meeting of the UN Security Council. Russia's ambassador to the U.S., Anatoly Antonov, added in a statement that "such actions will not be left without consequences." But any retaliation is not likely to involve a reduction of Russian oil and gas flows to Europe, analysts said. "The Russian budget is heavily dependent on exports," Andrey Polischuk, an analyst with Raiffeisen Bank told S&P Global Platts. "It would be illogical to cut your own earnings." Mikhail Sheybe, an analyst with Sherbank CIB, agreed and said any such move "would be against its own interests." The airstrikes came in response to a suspected April 7 chemical attack by the Assad regime in Douma, a town near the capital Damascus that is one of the remaining areas controlled by rebels opposed to the government. Syria and Russia, as well as Iran, another key Assad ally, have denied that a chemical attack took place. Russia had threatened to shoot down any missiles launched by the U.S. and its allies into Syria, after U.S. President Donald Trump had taunted Russia earlier in the week on Twitter that it should "get ready" for missiles to begin firing. 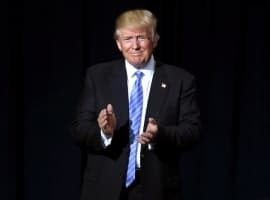 In a televised address Friday, Trump warned Moscow Friday night not to continue down the "dark path" of continuing support for the Assad regime. 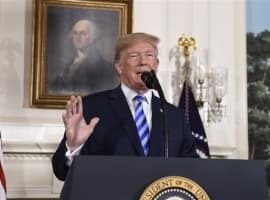 "We are prepared to sustain this response until the Syrian regime stops its use of prohibited chemical agents," Trump said. He added: "Hopefully, someday we'll get along with Russia and maybe even Iran, but maybe not." US Defense Secretary Jim Mattis said in a press briefing Friday that the airstrikes were a "one-time shot" and that "right now we have no additional attacks planned." General Joseph Dunford, chairman of the U.S. Joint Chiefs of Staff, said at the same briefing that the Syrian facilities struck were targeted "to mitigate the risk of Russian forces being involved." Is The Oil Market Ready For Sanctions On Iran? There was really never much chance that Iran or Putin would retaliate against the USA because they helped Assad use chemical weapons. First of all the entire world, on top of Russia poisoning that guy and his daughter in London, knows what they are up to. Second, and the deciding factor they'd both get their clocks cleaned if they decide to attack the USA directly, and they know it. They no doubt will meddle elsewhere, but they've been put on notice that the weak, America Hating, worthless, appeasing, surrendering Obama/Democrat regime is history. Trump may want good relations with Putin and Russia, but he's not a weak moron like Obama, and if they've paid attention they know he always hits back. They are lucky that he didn't do more this time. Clearly he is giving patience one more chance. Putin and Iran would do well to realize that they could end up in open conflict with the USA and exactly what that would mean. And yes Putin has NUKES. So do we. If he thinks Trump will sit idly by while he does as he pleases and hurts the interests of the USA and its allies he's sadly mistaken. China and North Korea should be paying attention.